Preheat your George Foreman Grill with lid closed for 5-10 minutes. Combine meat, Worcestershire sauce, parsley, salt and pepper. Mix well. Drizzle melted butter over meat mixture and mix some more. Make into 3 burger patties of about 3/4″ thick. Place on your Foreman Grill and grill for 5-8 minutes for medium doneness. 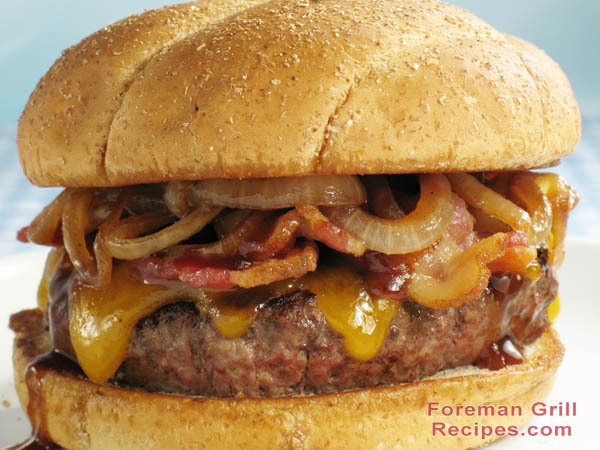 Pub burgers are best served with grilled onions and special sauce. Mix all sauce ingredients well until thick and serve over warm pub burger. Using kaiser buns will give the pub burger a good foundation and hardy taste. Be sure to toast the buns and add cheese of your choice. An of course, add bacon for even more robust flavor! Do the cooking times apply to the George Forman we have had for years? I am planning on buying the electric grill for our new deck very soon.